And Covert Video Recording Will Never Be The Same Again! 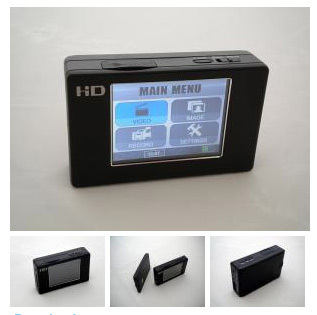 ALSO WITH TOUCH SCREEN MODEL-CLICK HERE TO REVIEW IT! EASY AND QUICK OPERATIONS AND SETTINGS! MANY FREE ACESSORIES NOW INCLUDED! OTHER MASSIVE SELECTIONS NOW IN STOCK! PV500ECO Pocket DVR From Lawmate - A New Evolution! 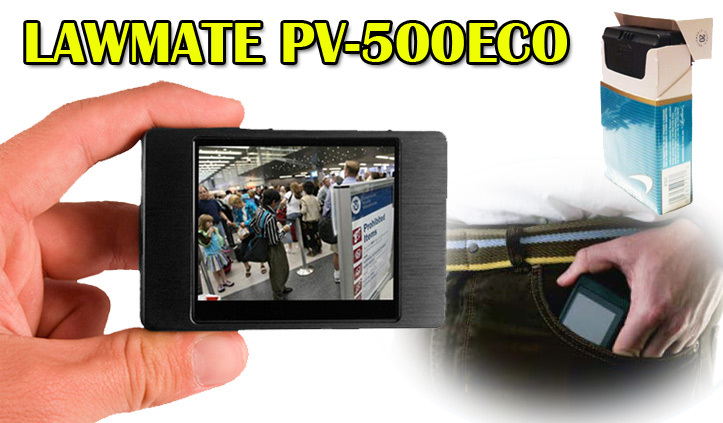 The PV500ECO From Lawmate is a new evolution in bodywear and multifunction law enforcement grade pocket DVRs. This evolution features high definition (720p) resolution of 1280X960 @ 30 frames per second. Not only is the resolution better, the new PV500EVO system is now compatible with both Windows and Mac OS operating systems! The PV500ECO is compatible and powers a wide selection of covert cameras and gives you a high grade body-worn DVR system. However, with it's motion activation features, it can also be used as a stationary covert video recording system when that is needed. You can also obtain an optional seven hour battery for the PV500ECO which simply slides on to it's back. When it comes to covert video cameras and digital video recorders, there is only one name you should trust for your covert video surveillance operations and that name is Lawmate. Law enforcement grade and built from the ground up for special covert video applications. Lawmate brand DVRs are made so they can be firmware upgraded so as new features come out, you can install software upgrades. Since Lawmate is developing innovative features that never stops, this will become important to you as time moves forward. Able to record 1280 x 960 (720P High Definition) in real time onto a 1GB and up to 32Gb SDHC card. Featuring direct power output to support most CCD cameras (5v output). Carrying additional batteries for cameras are now a thing of the past. The Ultimate Covert Video Recorder That's Law Enforcement Grade! Don't Settle For Anything Less for Your Professional Covert Video Operations! Click Here To Review The New Touch Screen PV500EVO! It's so small, it can fit into a pack of cigarettes. You can hide it anywhere and it's great for "bodywear" applications. It's completely black so there are no "shiny" objects that might call attention to it in sun light reflection when conducting outside covert video operations. The new generation PV500ECO gives you quick and easy access to functions and settings through easy to use screen control. No more side buttons to figure out how to operate! It's all build right into the screen. PV500ECO is able to record 1280 X 960 super high resolution quality video! It just doesn't get any better than this! 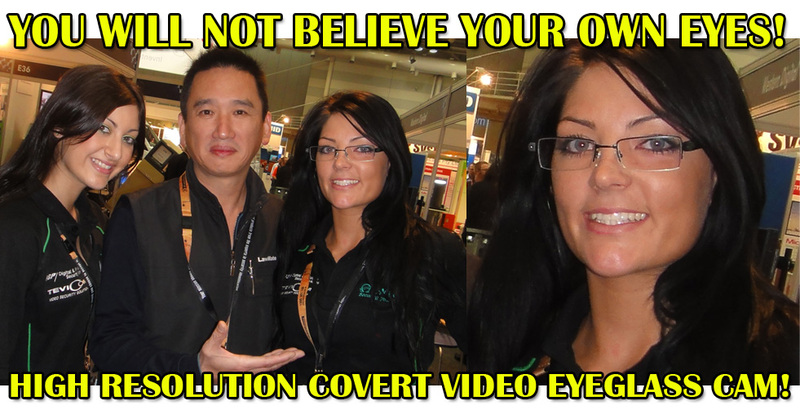 If you want the very best end results you can obtain in covert video, this is it! Able to record 1280 x 960 (720P High Definition) in real time onto a 1GB and up to 32Gb SDHC card. With the soaring popularity and stability of the Apple/Mac OS operation system, The Lawmate PV500ECO is now compatible for both Windows and Mac! PI Black gives you true time and date stamping you can place on all your covert videos. Time and Date stamp as well as a watermarked number allocated and burnt into every frame like pages on a notebook. The video files are tamperproof. The new generation Firmware gives you a motion activation feature you will love! This makes The PV500ECO suitable for any type of covert video application rather you need to do a stationary position operation or use for "Bodywear" functions. That's correct! Only PV500ECO powers a selection of top quality covert video cameras so there is no need to worry with battery power for your cameras. With the optional slider, the PV500ECO will now power almost ANY covert camera! This unit is the best selling unit used by law enforcement and investigative applications and it's known for it's high quality! During it's life, the software has been upgraded several times. When new software upgrades become available, you can get the upgrades just like you do with your computer instead of having to buy another unit! Since Lawmate is known for top grade innovation and new features no one else has, this will become important to you. PV500ECO DVR PI Black is easy to use! Within a few minutes, you will be using it right out of the box. PV500ECO DVR PI Black is very rugged and made for law enforcement and surveillance field use. in Los Angeles. Private Intelligence Agencies Had A Strong Presence. 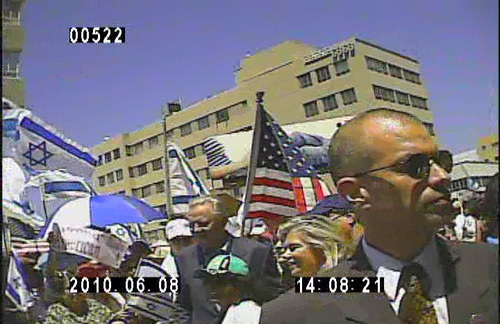 Agents Used Lawmate Brand Covert Video Equipment And Products To Monitor! This Is A Freeze Frame From One Of The Covert Videos. Note The Time And Date And Frame Count. Where Is The PV500ECO? It's so small You Don't See It! It's Invisible hidden in pockets. 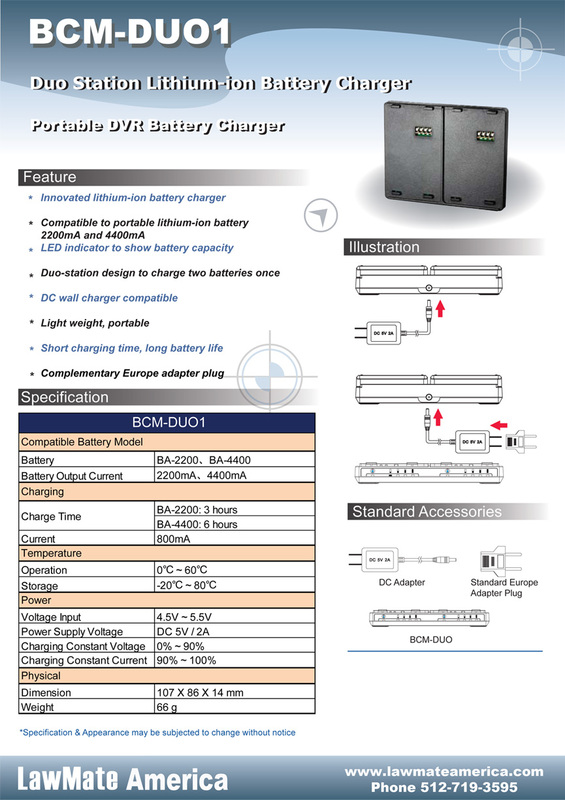 It's About A Whole Lot More Than Just The High Grade High Resolution PV500! Using a cheap camera with the PV500ECO DVR is a lot like taking a cheap camcorder from five years ago and playing your recording on your high definition TV. It is a waste of time and money! That's why there is a huge and complete line of high grade CCD cameras to go along with your PV500ECO you can select from so you always have law enforcement grade and trail presentation quality. While we know and understand that there are a number of people that will sell you a "cheaper" camera, it's important that you know and understand some of these bait and switch tactics and understand the difference between a "cheaper" camera and a real one. Our complete high resolution CCD camera line is built specifically to work and be powered by the PV500. Don't settle for anything less! Aside from high grade CCD covert cameras for your PV500ECO, you will also find an extensive line of options and accessories that now number over two dozen to make the PV500ECO the very best and most versatile portable covert video recording studio in the world built from the ground up especially for law enforcement grade covert video operations. A Friend Of And Perfect Match With The PV500! 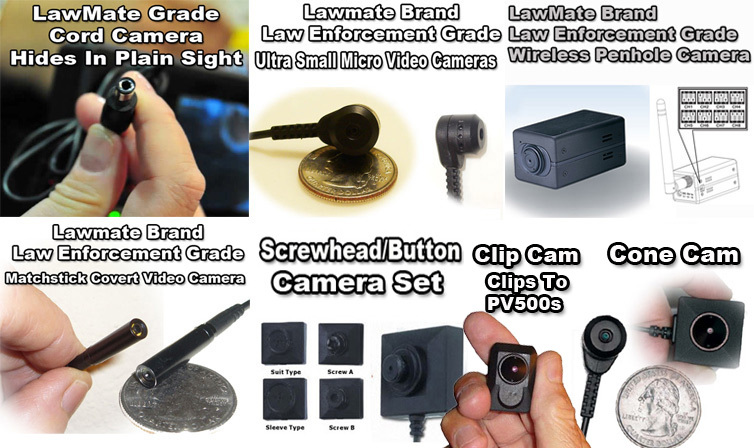 Three Different Button/Screw-Head Lawmate Grade Camera Kits! NOTE: ALSO WITH TOUCH SCREEN MODEL-CLICK HERE TO REVIEW IT!